Summer is over, yet here I am trying to catch up on my summer vacation posting. 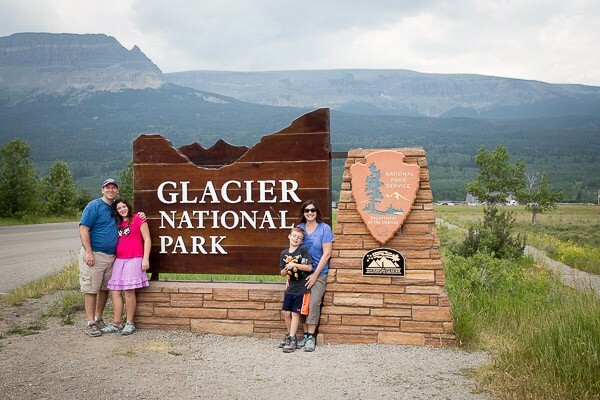 Posting this last post, about our days in Glacier National Park, has been on my to-do list for the past month and a half. But so are so many other things, and those things have taken priority. Ah, Glacier. This amazing national park embedded itself into my soul. I can’t stop thinking of it or reading about it or looking at online photos of the park. During the week, I check my weather app for local weather, and then I automatically check the weather forecast in Glacier. I tell my husband about bear sightings or recent snow in the area. I’m certain he’s getting tired of me doing that, but I can’t seem to help myself. 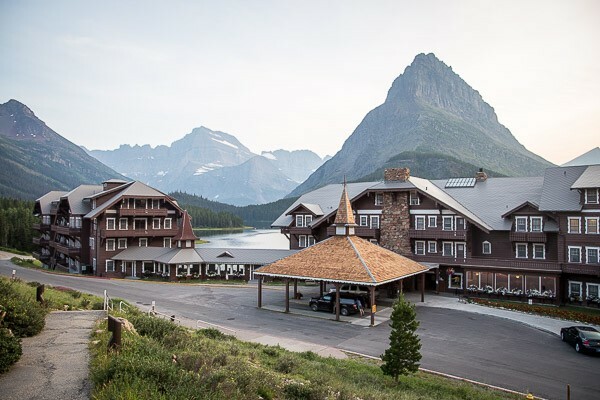 We were lucky to snag rooms in the historic Many Glacier Hotel for a couple of nights. We booked our room about a year in advance. It was small, with two double beds, no air conditioning, a clawfoot tub in the bathroom, and a shower rigged into the tub that required following a list of about 17 steps in order to turn it on – and again, in reverse, to turn the shower off. I loved it. On our first full day there, we took a Red Bus tour of the eastern part of the park. 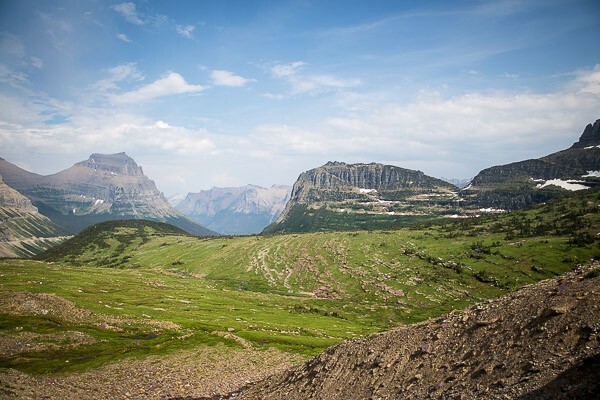 The highlight of that tour was the drive along Going-to-the-Sun Road, the nearly 50 mile two-lane highway that cuts through the middle of the park from east to west. The Red Bus tour is a lovely way to travel part or all of that distance while someone else does the driving. Our Red Bus tour took us from our hotel to the visitors center at Logan Pass before turning around and heading back to the Many Glacier Hotel. The kids seemed to enjoy the tour, but we were all a bit stir-crazy after riding in the back of that vintage bus for four hours. An afternoon family row boat trip (without a bus-load of chatty tourists) was exactly what we needed. Sam did all the rowing, so the kids and I loved it. 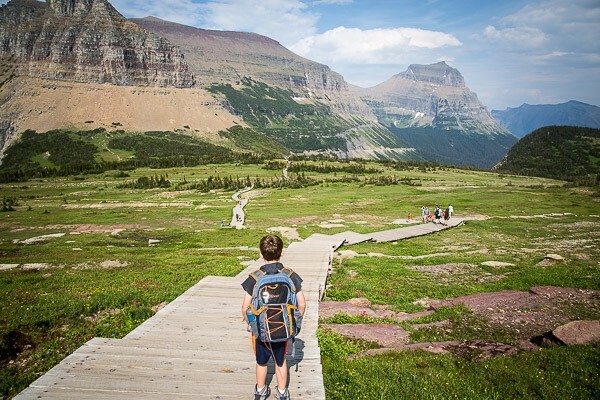 On one of the next days, we made our way back to Logan Pass to hike to the Hidden Lake Overlook. The trail was 3 miles roundtrip, with an elevation gain of 550 feet. The first part started as boardwalk, so it appeared that it would be an easy hike. It was not. The boardwalk eventually ended (and there were lots of stair steps on that boardwalk), and the climb upward continued. 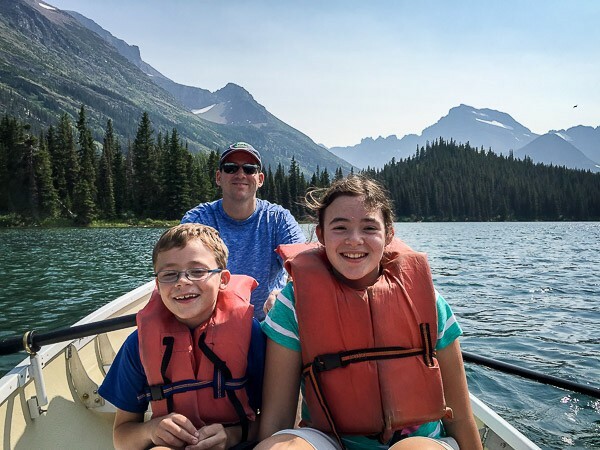 The day was warm, and the kids were complaining — one more vocally than the other — so the trip up was not as pleasant as these photos might imply. 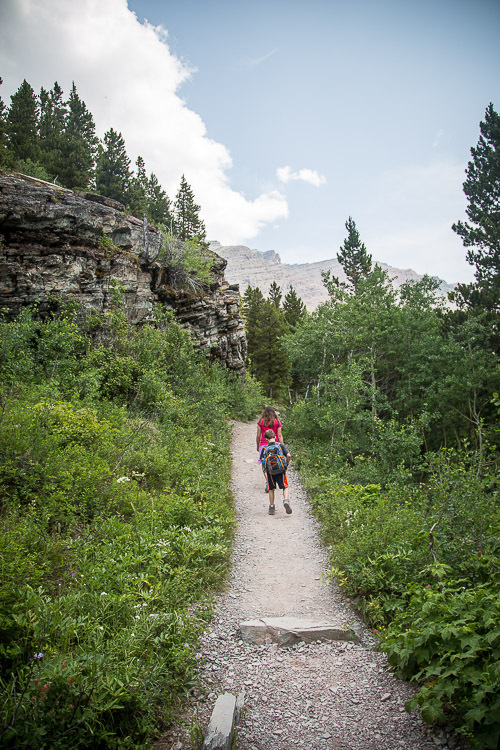 As we neared the upper portion of the trail, though, the crowds thinned — the idiots wearing flip flops had turned around by then — and a crisp breeze came off the nearby snowfields. 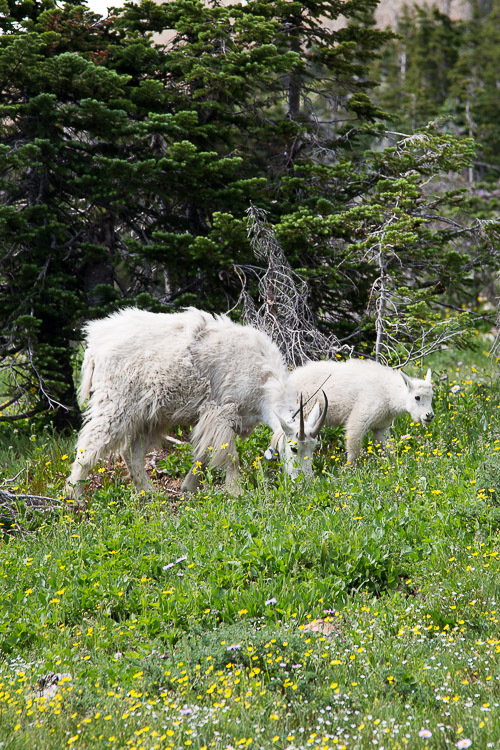 Mountain goats wandered nearby, sometimes on the trail itself, and they dotted the snowfields. 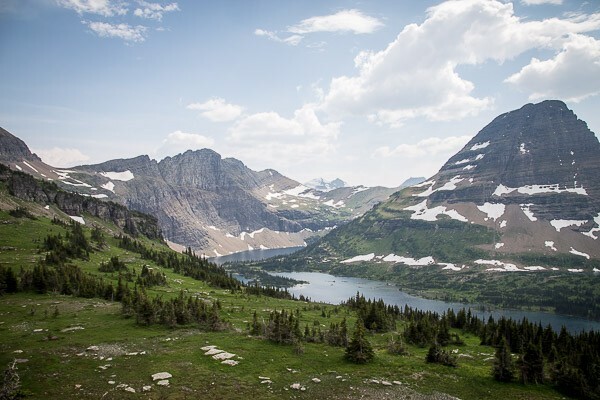 The views were stunning, and the Hidden Lake Overlook was completely worth that hike. View of Hidden Lake from the overlook. Sam was disappointed in our bear sightings in Glacier. 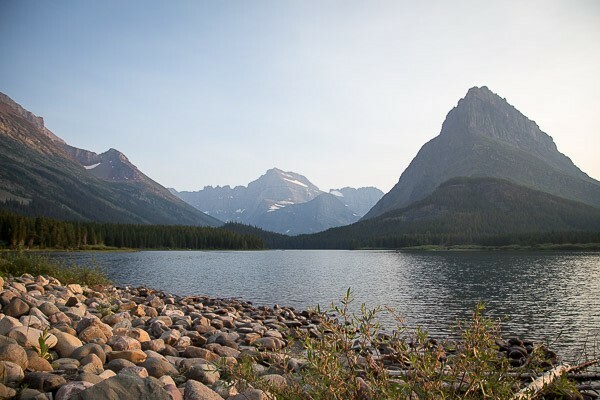 We saw two — both black bears — when we first arrived at Many Glacier after our drive south from Canada. After that, no bears at all. 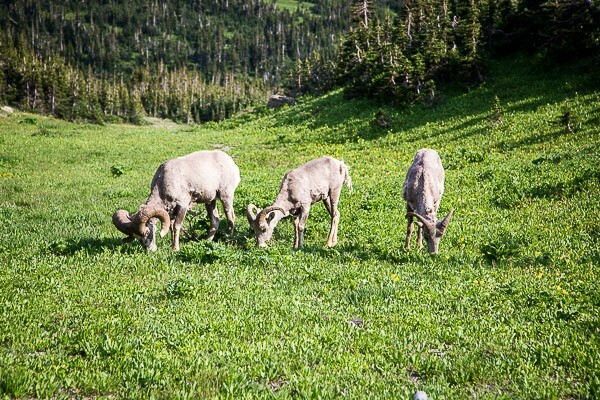 The lack of bears was made up for, though, buy the abundance of mountain goats and bighorn sheep in the Logan Pass area. 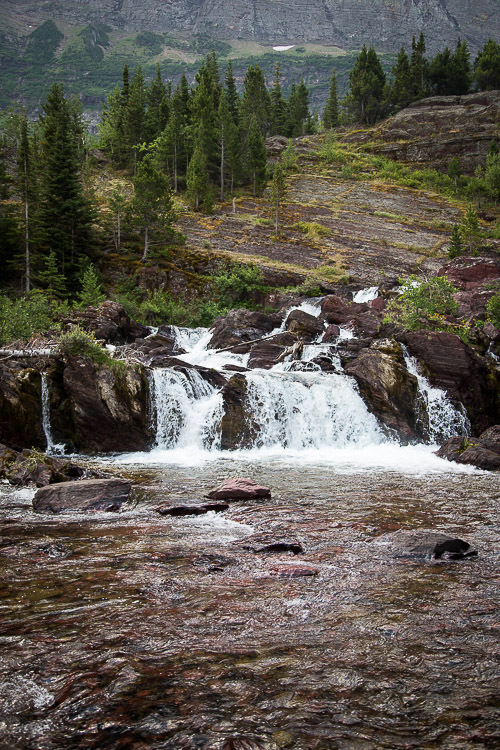 The same day we hiked the 3 miles to Hidden Lake Overlook, we also hiked to Red Rock Falls, out of the Swiftcurrent Pass area, a 3.6 mile roundtrip. This hike was a fairly gentle hike, according to our guidebook. There was much less whining from the kids on this hike, so I guess the guidebook was right. There were bugs near the lake, though, and that brought a whole different variety of complaints. In spite of the complaints, the waterfall was loud and wonderful. I took a video on my phone, and you can hear the roaring of the falls for yourself. As much as they complained, though, my kids were really quite the little troopers. They hiked almost 7 miles, and this was just 3 days after the previous 7 mile hike. Fourteen miles within three days isn’t bad for two iPad-addicted, technology junkies. Our last hike of the Glacier trip was to Avalanche Lake, on our last full day in the park. We arrived at the trailhead in the morning, with our backpacks filled with water, granola, and peanut butter and jelly sandwiches for lunch. The hike was a 4-mile roundtrip, and like most of the hikes that we did, the first part was a tough uphill climb for us. Despite that, Sam and I loved it. 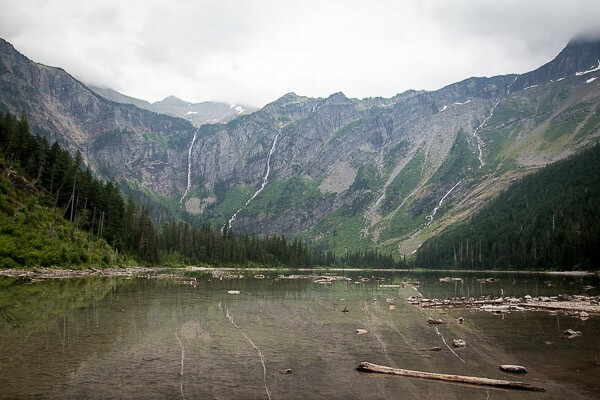 Avalanche Lake is a subalpine lake on the western side of Glacier, and the lakeshore was peaceful and quiet. 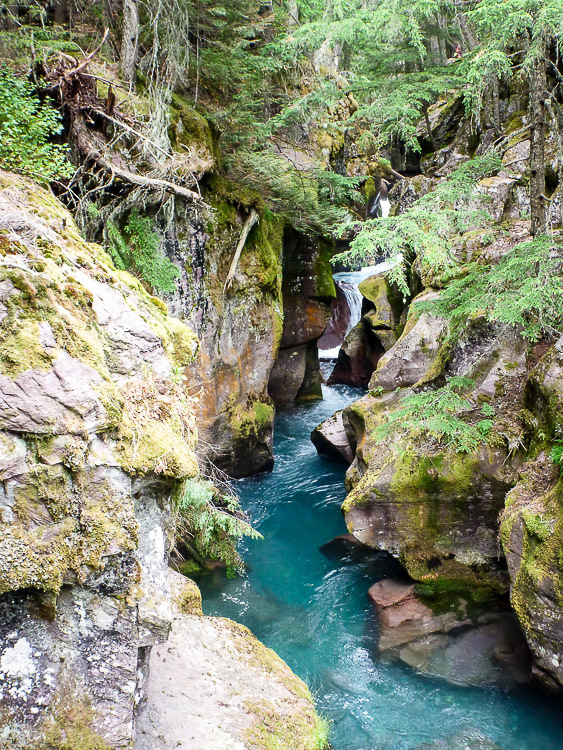 Waterfalls tumbled over the far mountainside, and chipmunks and ground squirrels scavenged for crumbs along the fallen trees along the waters edge. We sat on one of these logs and ate our PB&Js in silence, marveling at our surroundings. 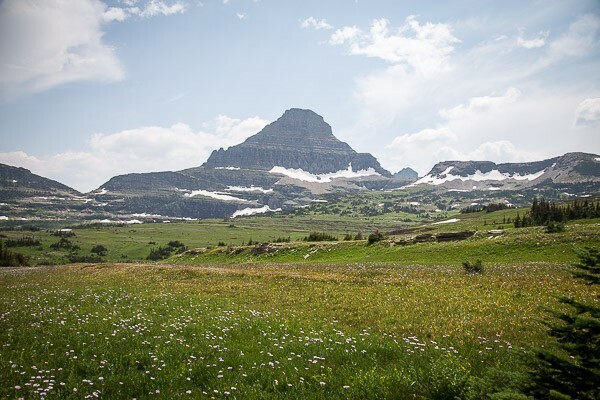 We finished our final day in Glacier with a drive to the North Fork area, far in the northwest corner of the park, at the border of British Columbia and Montana. 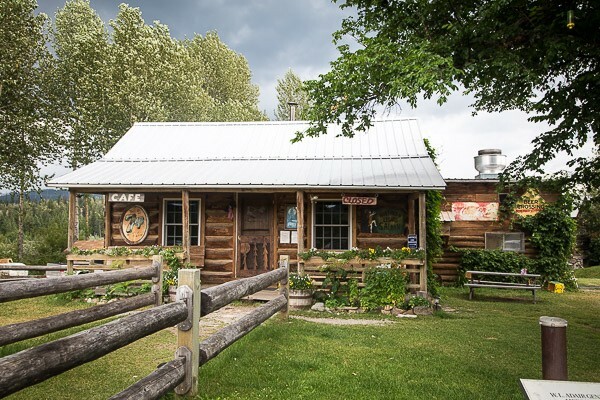 Our primary goal was to explore this remote part of Glacier — it can only be visited by driving an hour over a rough, gravel road filled with potholes, with no gas stations or other services — but our other goal was to have a beer at the Northern Lights Saloon in Polebridge. We also discovered fantastic pastries at the Polebridge Mercantile. 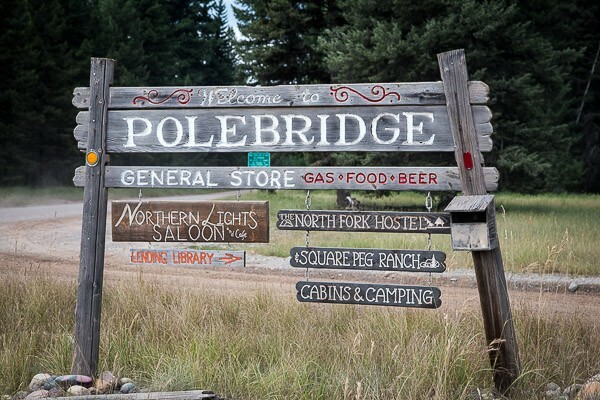 Being in Polebridge felt like being in another country all together. The handful of buildings there run on generator power, and while we sat in the saloon having a local beer, the power was out for most of our visit. The shared bathroom for the Mercantile and the Northern Lights Saloon was an outhouse with a pack-it-in/pack-it-out policy. Remote and rustic seem like understatements. 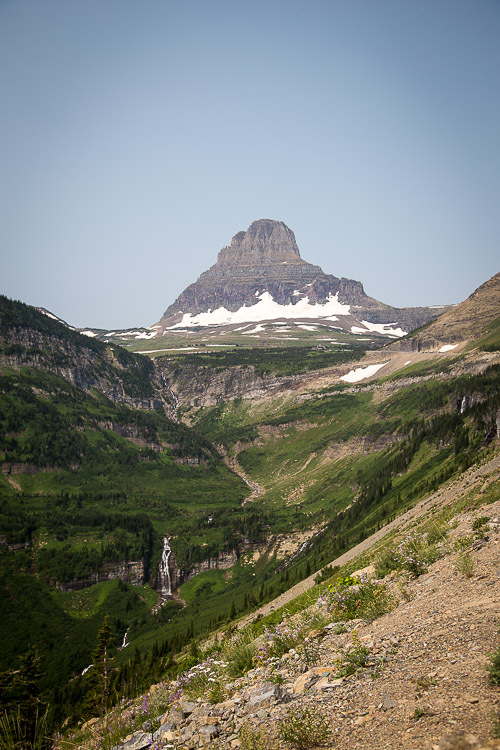 We have several Glacier hikes on our wish list that we weren’t able to do. 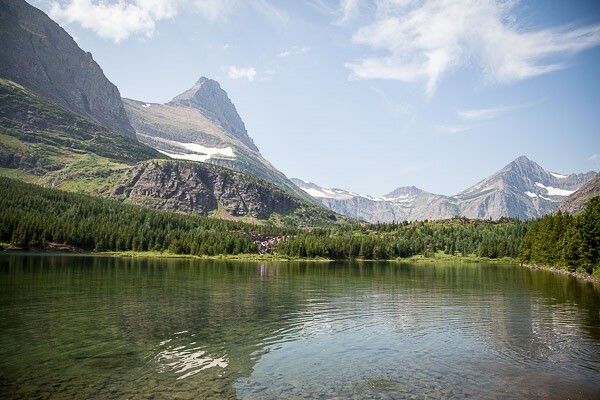 We never made it to Iceberg Lake, and we’ve heard great things about the hike to Grinnell Glacier. Both of those hikes are over 9 miles – one is 9.4 and the other is 11 miles round trip – and we just ran out of time. Plus, I’m sure the kids would have been even more miserable. 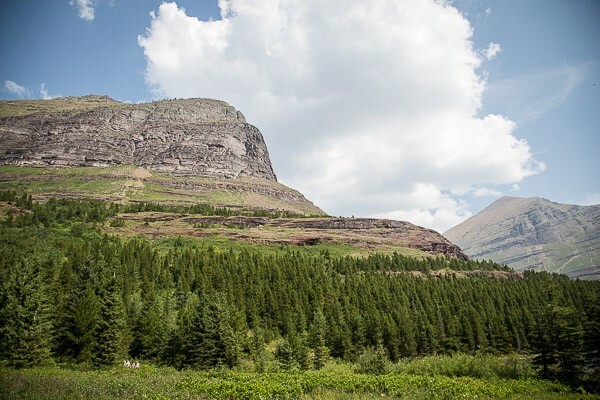 I’d like to go to Glacier in the fall, to see the leaves change colors. I’d like to go there in the winter, to see it covered in snow. I’d like to go again in the summer, to do more exploring. Mostly, I’d just like to go back. Gosh! Beautiful pictures. The children will forever remember this trip. 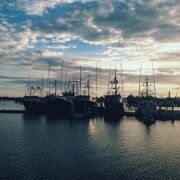 Thank you for sharing your trip and so many of your beautiful photos. I admire both your photographic skills and your discipline to chronicle the trip. My journal entries usually wane quickly after a few days on a trip. Beautiful job. P.S. I’m sure the waitress who gave you a * little shower* was mortified…I know I would be. 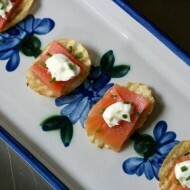 The sombre hostess who wasn’t happy with your late dinner arrival probably just needs a little vacation time herself. 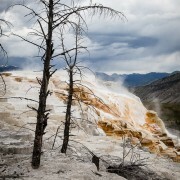 My family just got back from a similar trip (Tetons/Yellowstone), and I’ve so enjoyed looking at your beautiful photographs and reading your experiences. What an incredible part of our country, and how great that you and your family got to experience it together. Thanks for sharing!